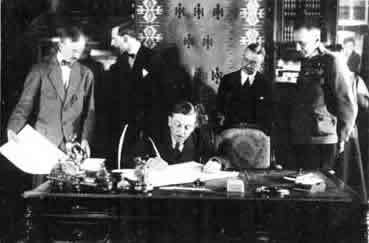 Photograph of the German foreign minister, Richard von Kühlmann, signing the Treaty of Brest-Litovsk, 3 March 1918. In his 10-month period as German foreign minister, Kühlmann signed the two treaties that confirmed the triumph of the Central Powers on the Eastern Front: the Treaty of Brest-Litovsk with Bolshevik Russia in March 1918 and the Treaty of Bucharest with Romania two months later. Both settlements brought closer to reality the German aim of establishing a chain of satellite states in eastern Europe. Under the terms agreed at Brest-Litovsk, the Bolsheviks immediately ceded control over Poland, Lithuania, the Ukraine and Finland and (in August 1918) abandoned Estonia and Georgia to German troops.